Last week we discussed developing a schedule that works for you. Today I’m sharing our homeschool daily schedule. 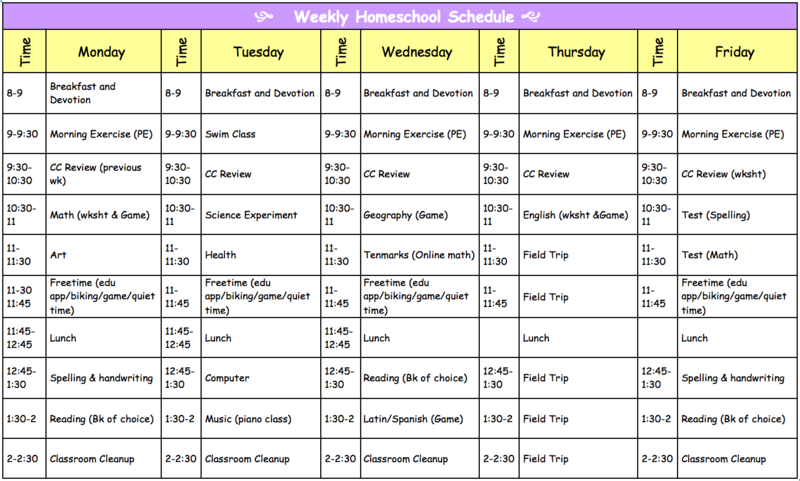 One of the easiest ways, not to feel overwhelmed by homeschooling is to develop a basic schedule. It helps guide you and give your students a chance to know what to expect and let them know what they have to look forward to. Schedules are not set in stone and are made to be revised as needed. If your homeschool schedule isn’t right for your children make changes when needed so they can get the most out of their day. How will you know that you need a new schedule? You will know your homeschool schedule needs to be revised if your child/children are having a hard time accomplishing the tasks you outline for the week. If your child is falling asleep during instruction, or is having a hard time focusing on the task assigned. Lastly if you are discouraged during the day, it is time to revise your schedule. Homeschooling allows you to be flexible, so having a schedule is simply to help you hold yourself accountable, reduce classroom anxiety, and give you weekly goals. However, you should not let the schedule rule your classroom with an iron fist. Allow your schedule to be flexible enough where you can have room for further or less instruction as needed. Remember, you are teaching your child from home so your child can get the most out of learning and he / she will develop a lifelong love for learning, so be comfortable knowing that you can change the schedule when it is necessary.